Staedtler Lumocolor Fine Tip Water Soluble OHP Pen Assorted (Pack of 4) 316-WP4 Pack of 1 "Pen for OHP film and other glossy surfaces. Fine tip 0.6mm. Water-soluble. Dry-Safe ink for up to 2 days cap-off time. Fast drying ink prevents smudges. Colour: red, blue, green, black. Pack of 4 pens in rigid wallet." Staedtler Lumocolor Medium Tip Water Soluble OHP Pen Assorted (Pack of 8) 315-WP8 Pack of 1 Pen for OHP film and other glossy surfaces. Medium tip 1.0mm. Water-soluble. Dry-Safe ink for up to 2 days cap-off time. Fast drying ink prevents smudges. Colour: Assorted. Pack of 8 pens in rigid wallet. 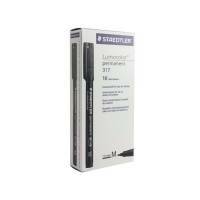 Staedtler Lumocolor Medium Tip Permanent OHP Pen Assorted (Pack of 4) 317-WP4 Pack of 1 "Pen for OHP film and other glossy surfaces. Medium tip 1.0mm. Permanent ink for lasting use. Dry-Safe ink for up to 2 days cap-off time. Fast drying ink prevents smudges. Ink colour: red, blue, green, black. Pack of 4 pens in rigid wallet"
Staedtler Lumocolor Fine Tip Permanent OHP Pen Assorted (Pack of 4) 318-WP4 Pack of 1 "Pen for OHP film and other glossy surfaces. 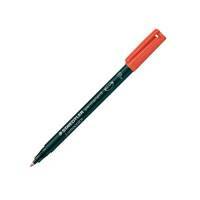 Fine tip - 0.6mm. Permanent ink for lasting use. Dry-Safe ink for up to 2 days cap-off time. Fast drying ink prevents smudges. Ink colour: red, blue, green, black. Pack of 4 pens in rigid wallet." 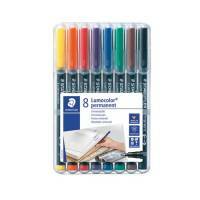 Staedtler Lumocolor Fine Tip Permanent OHP Pen Assorted (Pack of 8) 318-WP8 Pack of 1 "Pen for OHP film and other glossy surfaces. Fine tip - 0.6mm. Permanent ink for lasting use. Dry-Safe ink for up to 2 days cap-off time. Fast drying ink prevents smudges. Yellow, orange, red, green, blue, purple, brown, black. Pack of 8 pens." 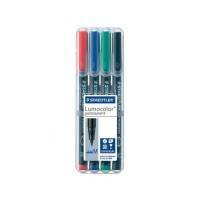 Staedtler Lumocolor Superfine Permanent OHP Black Pen (Pack of 10) 313-9 Pack of 10 Lumocolour Superfine Permanent. A pen for use on a variety of surfaces. Produce high-intensity coloured presentations on your OHP. Superfine 0.4mm tip. Black. Pack of 10. Staedtler Lumocolor Medium Tip Water Soluble OHP Black Pen (Pack of 10) 315-9 Pack of 10 Pen for OHP film and other glossy surfaces. Medium tip 1.0mm. Water-soluble. Dry-Safe ink for up to 2 days cap-off time. Fast drying ink prevents smudges. Colour: Black. Pack of 10 pens in rigid wallet. Staedtler Lumocolor Fine Tip Water Soluble OHP Black Pen (Pack of 10) 316-9 Pack of 10 Pen for OHP film and other glossy surfaces. Fine tip 0.6mm. Water-soluble. Dry-Safe ink for up to 2 days cap-off time. Fast drying ink prevents smudges. Colour: Black. Pack of 10 pens in rigid wallet. Staedtler Lumocolor Medium Tip Permanent OHP Black Pen (Pack of 10) 317-9 Pack of 10 Pen for OHP film and other glossy surfaces. Medium tip 1.0mm. Permanent ink for lasting use. Dry-Safe ink for up to 2 days cap-off time. Fast drying ink prevents smudges. Ink colour: Black. Pack of 10. Staedtler Lumocolor Fine Tip Permanent OHP Red Pen (Pack of 10) 318-2 Pack of 10 Pen for OHP film and other glossy surfaces. Fine tip - 0.6mm. Permanent ink for lasting use. Dry-Safe ink for up to 2 days cap-off time. Fast drying ink prevents smudges. Red. Pack of 10. 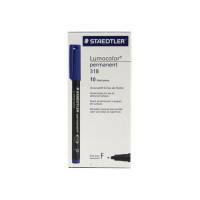 Staedtler Lumocolor Fine Tip Permanent OHP Blue Pen (Pack of 10) 318-3 Pack of 10 Pen for OHP film and other glossy surfaces. Fine tip - 0.6mm. Permanent ink for lasting use. Dry-Safe ink for up to 2 days cap-off time. Fast drying ink prevents smudges. Blue. Pack of 10. Staedtler Lumocolor Fine Tip Permanent OHP Black Pen (Pack of 10) 318-9 Pack of 10 Pen for OHP film and other glossy surfaces. 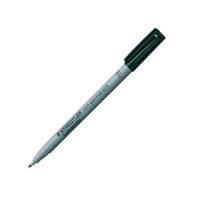 Fine tip - 0.6mm. Permanent ink for lasting use. Dry-Safe ink for up to 2 days cap-off time. Fast drying ink prevents smudges. Black. Pack of 10. 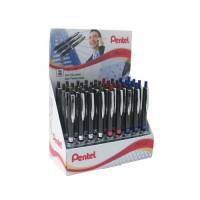 Pentel Assorted Oh! 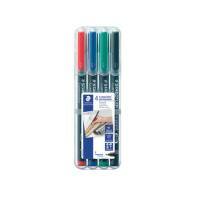 Gel Pens (Display (Pack of 36) K497/3D Pack of 1 "Gel pens with medium tip for most handwriting. Gel ink for quality results on most papers. Extra large metal clip for secure placement. Retractable design: click to extend tip. Retail display pack of 36. Assorted Colours: Red, Blue and Black." 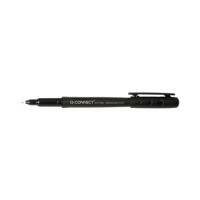 Q-Connect OHP Pen Permanent Fine Black (Pack of 10) KF01068 Pack of 10 "Q-Connect OHP Pens, write colourfully and dry quickly on OHP film and other smooth surfaces. Fine - Permanent Ink. Colour - Black."